CES visitors can swing by the AstroReality CES 2018 booth to get hands-on with LUNAR and the entire solar system. The Augmented Reality app will also allow users to follow in the footsteps of Neil Armstrong and Buzz Aldrin, and experience one small step for man and one giant leap for mankind by virtually landing on the moon. AstroReality’s LUNAR model launched on Indiegogo in September 2017, and hit a massive $210,399 within weeks, smashing its funding target of $50,000 by a whopping 516%. They began the year by winning the most innovative product award in 2018 from Indiegogo and now they are at CES in the Las Vegas Convention Centre where they are showcasing scientific interactive AR models of the solar system. Hand-painted and crafted using the most accurate and advanced 3D printing technology, the softball-sized LUNAR Pro is modeled to 0.006 millimeters per pixel precision as it features a high-resolution topography based on data captured by NASA’s Lunar Orbiter science team. With its AR app, AstroReality, weaves together an unparalleled way to experience the moon, in the hand, and through a smartphone. The AstroReality Mini Solar System includes nine mini models using the same precise measurement of LUNAR. 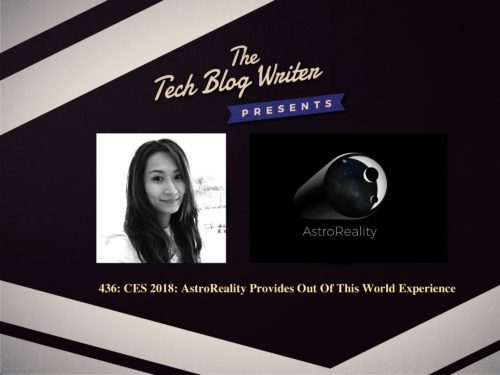 I invited Joanne Dai Co-Founder of AstroReality onto the show to find out more about their unique product and their tech startup story that has gone from a successful crowdfunding campaign to the show floor of CES 2018. Joanne Dai has worked for over 10 years at some of the world’s largest advertising agencies. Her passion for digital innovation and marketing technology led her to founding “Seismic Digital”, a boutique agency that partnered with some of the world’s top global brands. Like the other team members, she is endlessly curious about our galaxy, universe, astrophysics and Star Wars, of course. Check out Astro Reality on Facebook, Twitter, and YouTube.